Like an updated Polaroid camera of yore, their new Polaroid PoGo lets you snap a picture and get a printout in your grubby hands moments later. 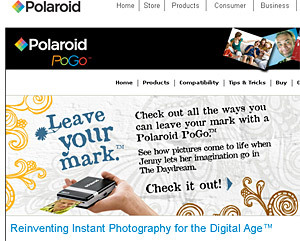 Thanks to the company busily, “Reinventing Instant Photography for the Digital Age,” the PoGo packs a five-megapixel digital camera with a built-in printer that can serve up a full-colour, 2×3-inch, peel-off, sticky-backed photo in less than 60 seconds. Unlike the old film based models, the PoGo has a few in-camera editing tricks up its sleeve, letting users crop photos, add borders, remove red-eye and print dates. Photos are stored on a memory card, so you won’t run out of film in a hurry, and there’s always the option to make bigger prints using a conventional printer afterwards. The first batch of Polaroid PoGo instant digital cameras is expected to hit the UK on the 12th May, with gadget site Firebox.com already taking pre-orders, which has a retail price of £229.95. 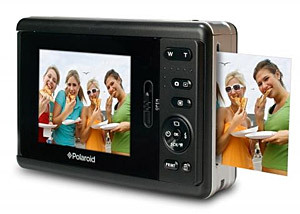 I really like this Polaroid camera, because it can print the photo only 60 seconds, very instant photo. there are many kinds of such beautiful and powerful consumer electronics with very cheap price , just have a look , I am sure you will like it! Next Next post: Amazon To Launch Newspaper Reader?